When we think of human-centered design, we tend to assume that step one must be: understand the “other” person; the customer, user, or beneficiary. While that approach is valid, it skips a vital step zero, originating from ancient Egypt & Greece: know thyself. Understanding ourselves, i.e. our vision, objectives, and actions, gives us the foundation we need to effectively understand other people. Once we understand ourselves, we’re better equipped to understand others. 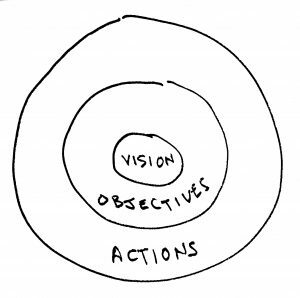 As Simon Sinek says, “Start with Why.” In Sinek’s TEDx talk, he illustrates a simple model of three concentric circles. 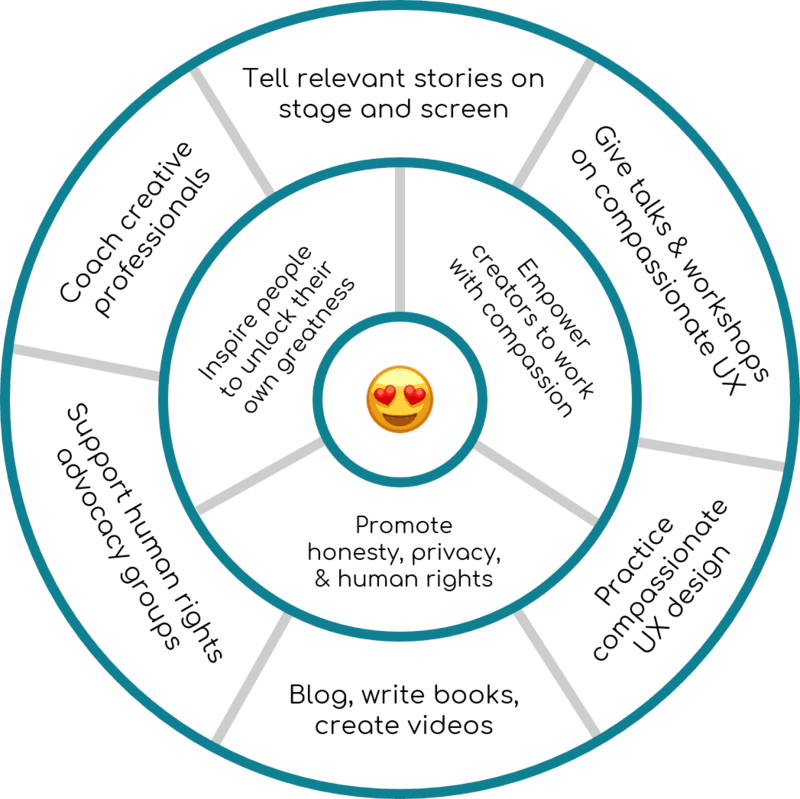 Each circle represents, from the inside outward: Why, How, and What. Why is our overarching vision, our North Star, our motivation. How represents the mission, our objectives for moving reality closer to our vision. And What maps our actions, the steps we’re taking to accomplish our objectives. It’s a quick & dirty combination of Sinek’s framwork, some core concepts of acting, and the OKR (Objectives & Key Results) goal setting approach. I use model to quickly sketch my Vision, Objectives, and Actions. 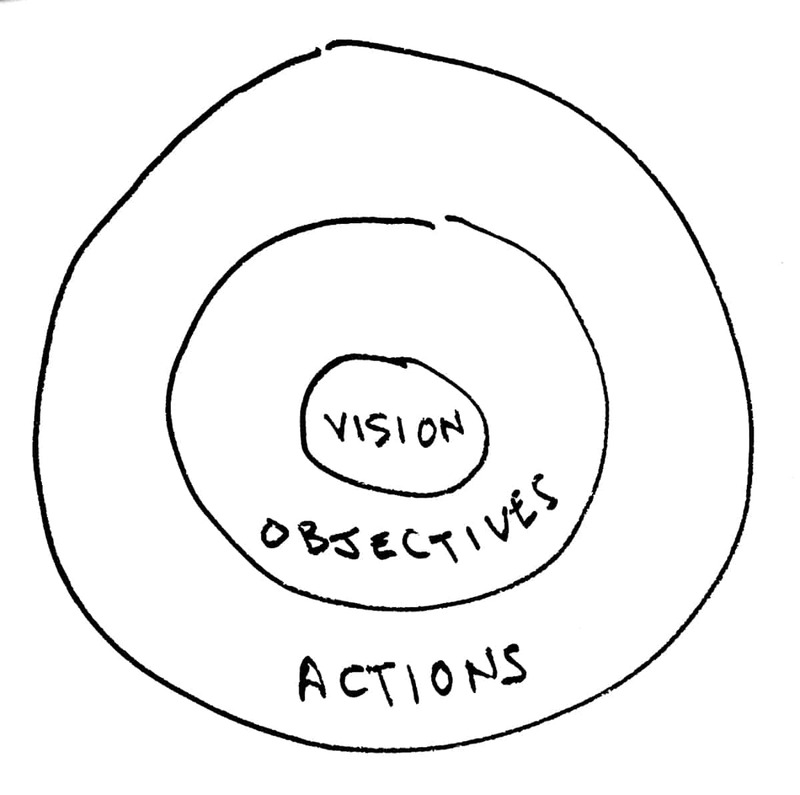 Like Sinek’s three levels, my Vision determines my Objectives, which in turn determine my Actions. I want to live in a safe world, full of love & compassion. The goal of this exercise is to bring your long-term goals (vision & objectives) into focus, so you can prioritize your activities (actions) accordingly. And while there’s no “right” or “wrong” way to do this exercise, I found two guidelines that help me formulate more effective objectives. However you decide to conduct this exercise, the idea is to give you something that propels you into action and helps you decide whether you’re just doing things, or doing the right things. In this case, doing the “right things” means performing actions that contribute to you achieving your objectives, and making your vision a reality. That’s why this exercise is so helpful for people in human-centered design. Once we understand ourselves, we’re better equipped to understand others. If my curiosity & empathy are a magnifying glass, this exercise helps me know where to point it. I hope it helps you too! Special thanks to Shyam, Bindu, and Hester for your feedback! 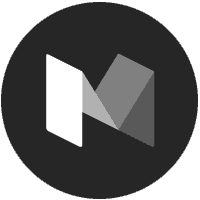 Next Post So Long, User Experience… Hello, Human Experience!